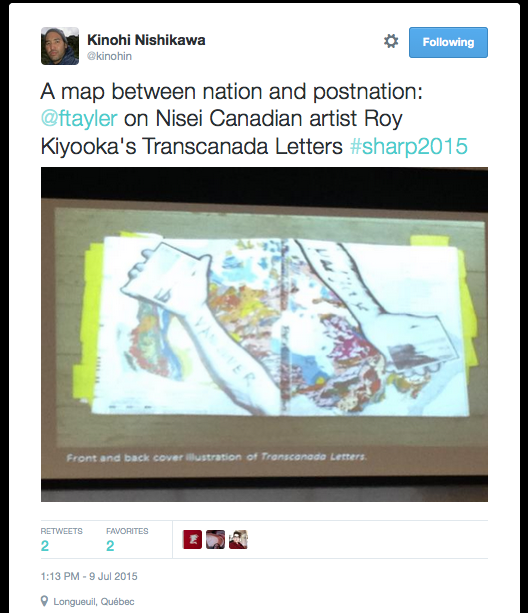 The front and back covers of Transcanda Letters show a multi-coloured illustrated map of Canada, overlaid by black and white snapshots of the east and west coast that are clasped in the left and right hands of the artist. The two snapshots are autobiographical and documentary in style – they confirm Kiyooka’s presence on both edges of the continent at specific times and locations. These images cause the reader to wonder where he is, and what his body is experiencing? The national boundaries of Canada are recognizable in this cover illustration; nonetheless, the map’s swirling amorphous shapes hold out the promise of an expansive psychedelic geography, as if the reader might “trip” through altered states of consciousness into another sense of place. Also note the grid indicating of longitude and latitude. These cartographic measurements typically help to define national boundaries and exploitable national resources contained within. But Kiyooka has placed this grid between his own hands, thereby turning the national territory into a material form that he could use to construct an imaginary space. Is the space that this book produces a national imaginary that Benedict Anderson associates with the hegemony of print culture? – Or is it a post-national space anticipating other media forms?